The global financial crisis of 2008 was essentially caused by excessive leverage, a loss of confidence in real estate credit and a resulting sudden collapse of liquidity in the financial system. The central bank response was to lower interest rates and flood markets with liquidity. Since then, debt loads have increased more than 30% and the percentage of higher risk credit has also grown sharply. Many analysts believe that another crisis is possible due to a combination of enormous leverage and deteriorating credit standards. What will happen to gold if we have another financial crisis? Not surprisingly, many investors think the next crisis will look like the last…all asset classes will fall in price including gold (although gold will fall less than the others). Gold will then rocket higher as central banks confront the crisis. That’s what happened in 2008. We disagree. We see few, if any parallels between today’s gold market and the gold market in 2008. We do not expect gold to correct in the early stages of a new financial crisis; we see an almost immediate positive impact on the gold price from a crisis and central bank policy responses. Gold hit a new all-time high of $1030 in March, 2008, the culmination of a seven-year bull market. It is reasonable to assume that after seven years of gains with only one serious correction (in 2006), gold was over-owned and highly leveraged. When overall market liquidity began to collapse leading up to the Lehman bankruptcy on September 15, 2008, gold fell 30% to just below $700 by November of that year. Overall, a 30% correction following a 400% gain is not unreasonable, to clean out the excess leverage and remove speculative weak hands. The significant role of speculation is proved by an examination of the gold basis data. The basis is the price of a futures contract less the spot price. 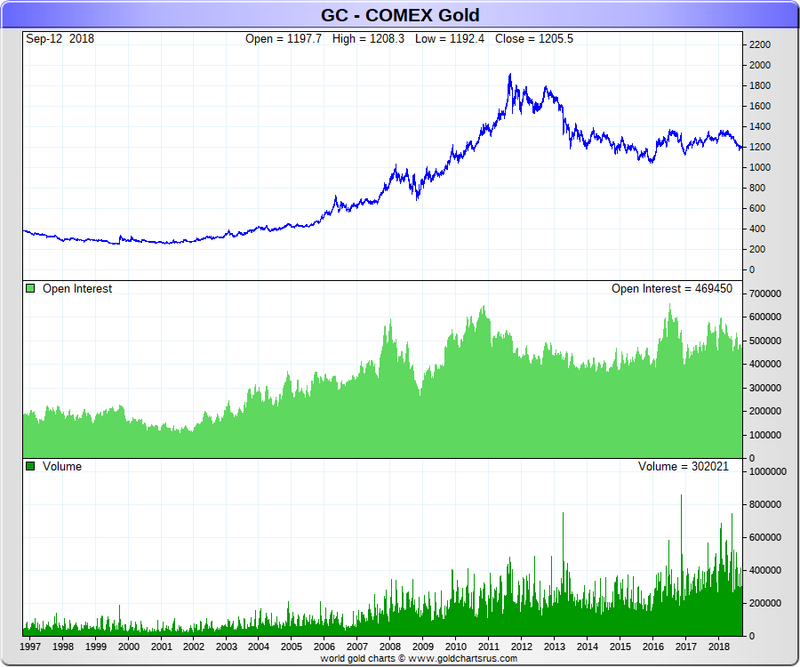 From 2004 well into 2007, the gold basis was rising along with the price. This fact indicates that speculators were bidding up futures contracts on the CME, where, because of margin and liquidity, speculators go to play. Not surprisingly, CME Open Interest reached a new, all-time high just short of 600,000 contracts in early 2008, just before the gold price hit its new record high. Margin calls in the second half of 2008 were, by all accounts, plentiful. As gold begins to fall, the basis also falls with it, indicating that liquidation in the futures market is driving the price. There are reports of margin calls in the futures market. Finally, as 2008 ends, gold moves towards backwardation for only the second time in modern history. 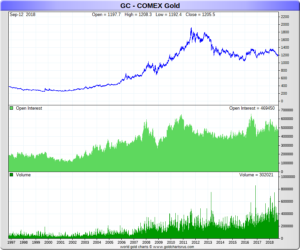 The February ‘09 gold contract went into backwardation on December 12, 2008. Backwardation indicates a rising demand for physical metal as liquidity/default-conscious traders exchanged gold paper for the added security of the real thing. If a financial crisis were to unfold today, it would meet a very different gold market. First, gold has now been in a bear market for seven years, falling from a high in September, 2011 of $1921 to a low of $1045 in December of 2015, since recovering to about $1190 today. This downtrend has driven out the leveraged longs and reduced speculation to a minimum. It would be very difficult to argue that gold is over-owned. The Open Interest is nearly 130,000 contracts lower than the peak in 2008. Speculators are actually net short for the first time since 2001, the speculator gross short position has just hit an all-time high and commercials are net long for only the second time in nearly 20 years. There is another angle to consider. The credit crunch of 2008/9 took months to be understood and counteracted by the central banks. Investors and banks alike had to learn how to act in response. The Federal Reserve ultimately figured out how to set up more than a dozen liquidity injection programs under a wide range of forgettable alphabet-soup names. Investors had to figure out where their money was safe and one of those solutions was physical gold, which led other markets out of the liquidity crisis and outpaced all other asset classes. Next time around, it will not take central banks and market players any time at all to recognize and respond to a liquidity crisis. As central banks move to re-liquify markets, dropping interest rates below zero and possibly eliminating cash withdrawals to keep liquidity in the banking system, we think investors will reach into an unleveraged but liquid physical gold market for protection against illiquidity and default.